Our planet appears to be big and sturdy with a world ocean, an atmosphere and a magnetosphere, all form an environment where humanity inhabits and on which it entirely depends. Therefore, a fundamental objective of science is to study the laws governing the ways in which the Earth evolves. This objective has led to the emergence of planetary geophysics, a system of sciences, that study the physical processes governing our planet and its separate regions. The mission of planetary geophysics is to perform research that will help us better understand tornados and earthquakes, the deep structure of the Earth and the eruption of volcanoes, polar auroras and earth tides, ice ages and magnetic storms, ocean currents, and crustal movements. Since the objectives of these research efforts are international, scientists studying the Earth join forces and work together. Geophysicists from all nations must actively cooperate because individually they are unable to draw valid conclusions from their separate scientific investigations. In 1875, Austrian geophysicist Karl Weyprecht came up with an idea of an international scientific investigation of the Earth. He wrote that knowledge breakthroughs in geophysics were limited because of the absence of simultaneous investigations in various fields, which would enable making comparisons, but such investigations would be possible only when the countries that had advanced views on the sciences decided to work together and completely exclude any national rivalry (Silkin, Troitskaya & Shebalin, 1962). 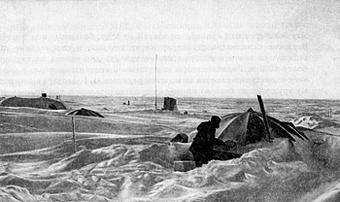 Weyprecht’s views were instrumental in bringing about the First International Polar Year (IPY) of 1882–83. The aim of the First IPY was to study the weather at high northern latitudes, which affects the world’s climate, the movement of drifting ice, and geomagnetic phenomena and the aurora. 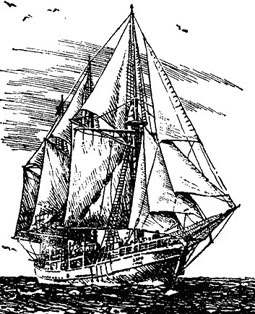 Twelve countries participated, and numerous expeditions were organized, including 12 to the Arctic and 3 to the Antarctic. By 1898, the results of the observations from the expeditions had been analyzed. They included unique data on drifting ice, the weather, geomagnetic phenomena, and polar lights and laid a foundation for further investigations by geophysicists in the coming years (Isaev, 1983). In the 50 years following the First International Polar Year, scientific knowledge and understanding of the Earth expanded considerably, and a suggestion was made to declare a Second International Polar Year. The Second IPY lasted from August 1932 to September 1933. Scientists from 44 countries participated, including ones from the Academy of Sciences and the Arctic Institute of the USSR More than 100 observation stations were established in the polar regions. As with the First IPY, a wealth of scientific information was gathered. For the first time ever, weather charts for the whole Northern hemisphere were drawn. The depths of the Arctic Ocean and the ice thickness at various points on the Antarctic were measured. A large amount of knowledge was obtained about the nature of polar lights and the close association between auroras and solar activity, and the speed of geomagnetic phenomena was established (Isaev, 1983). The advances in science and technology during the 25 years following the Second International Polar Year were remarkable and rapid, driving the need for new data on planetary geophysics. In 1952, the American scientist, Dr. Lloyd Berkner, a member of the International Council of Scientific Unions (ICSU), proposed on behalf of the ICSU conducting new geophysical research in areas of common interest. His suggestion was readily accepted and quickly transformed into the International Geophysical Year (IGY), which became the largest scientific project of the 20th century. Scientists from 67 countries (about two-thirds of the countries that time) took part in the effort (Chapman, 1959; Troitskaya, 1957). The committee adopted symbol for the IGY (Figure 2) showing the Earth partly in sunlight and partly in darkness. 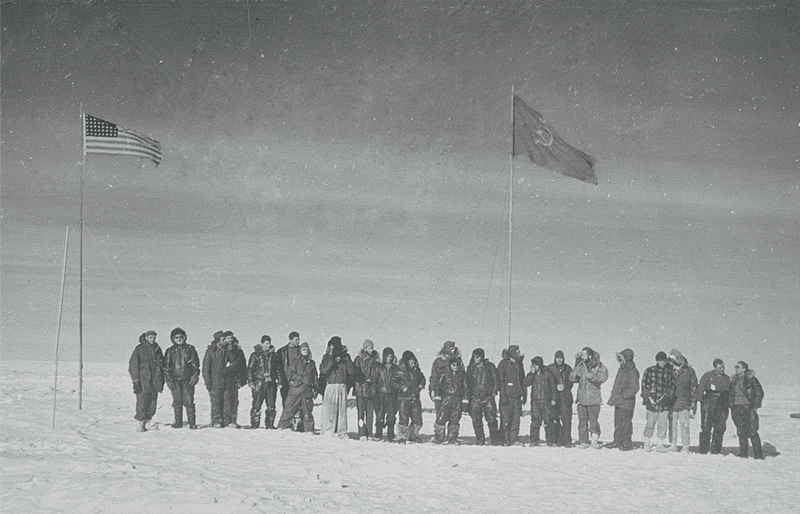 The viewpoint was the Antarctic to stress the special attention to be given to the Antarctic during the IGY. The USSR took an active part in this extraordinary event, which coincided with a period of political thaw in the country. Soviet scientists had already been focusing their efforts on international projects. In 1954, the government of the USSR established a special agency for coordinating all research conducted by Soviet scientists related to the IGY. 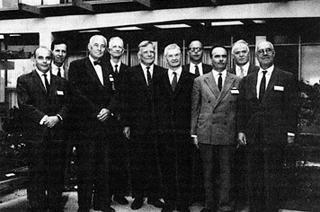 This Soviet Committee of the IGY was responsible for coordinating the IGY research. (Its present day counterpart is the Geophysical Center of the Russian Academy of Sciences.) I.P. 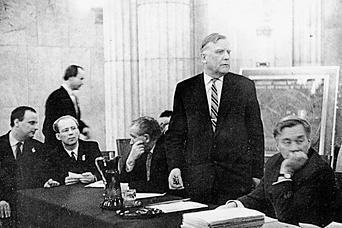 Bardin (the Vice-President of the Academy of Sciences, USSR) headed the committee, Prof. V.V. Belousov was the vice-chairman, and Prof. V.A. Troitskaya was the scientific secretary. The committee organized several sections corresponding to various aspects of planetary geophysics: meteorology, geomagnetism, auroras, solar activity, cosmic rays, the ionosphere, meteors, longitudes and latitudes, oceanography, glaciology, seismology, gravity, and rockets and satellites (Hrgian, 1956). A message from Academician I.P. Bardin as an officer of the committee to the IGY International Committee about the plans of Soviet scientists to launch the first IGY satellite signalled the Soviet entry into the IGY program. The launching of the first Soviet IGY satellite was a major event of the IGY (Silkin et al., 1962). The research program of the International Geophysical Year was many-sided. It included the study of the meteorological phenomena and physics of the atmosphere, the constant and variable magnetic field of the Earth, the polar lights and airglow, the ionosphere and the worldwide pattern of the distribution of radio waves, meteors and cosmic rays, all in an effort to obtain new information about the physical conditions on, near, and far from our planet. The program also included the study of the Earth’s interior and its seismic characteristics, of mountain glaciers, of polar ice caps, of physical processes in the world’s ocean, of variations in the gravity field on the planet’s surface, of the fluctuations in latitudes and longitudes, and of the true form and size of the Earth. On July 1, 1957, about 30,000 scientists were ready to begin many-sided geophysical observations at 4,000 scientific stations located on all 7 continents. One of the largest groups of geophysicists was the Soviet one. Soviet scientists at almost 500 Soviet stations and observatories, from Franz Josef Land up to Kushka, from the Baltic up to Chukotka, and even in the Antarctic, studied the planetary physical processes along with their foreign colleagues on the agreed upon program.. Research was also conducted on vessels at sea: the Soviet “Vitjaz” and “Michael Lomonosov”, the Australian “Diamantina”, the American “East Wind”, the German “Gauss”, the French “Jeanne D’Ark”, and the English “Explorer” (Chapman, 1959; Silkin et al., 1962). There was even a non-magnetic vessel, “Zarja”, from the USSR (Figure 3). Scientists on the research vessels collected samples of seabed rocks and ocean water, measured the speed of deep-sea currents and the intensity of the magnetic field on the ocean surface, and used shipboard radar to watch for flights of balloons carrying meteorological instruments. They all worked together on the agreed upon program. During the International Geophysical Year Soviet scientists established a drifting ice station NP-7 to collect the necessary information regarding the ice, meteorology, and hydrology of the Arctic Ocean. (Figure 4) The United States decided to maintain two drifting ice stations, “Alpha” and “Bravo” in the Arctic. At the other end of the world, in the Antarctic, twelve countries (the USSR, the USA, Great Britain, France, Belgium, Australia, New Zealand, Japan, Norway, Argentina, Chile and Sweden) established scientific stations for the IGY and carried out geophysical research (Figure 5). During the 30-month IGY, the scientists collected a large amount of data and recorded it on sheets of paper, in tables, and on maps and schedules. They also produced seismograms and magnetograms, both on paper and on film. When the IGY came to an end, most of the data were collected at World Data Centers for analysis and interpretation. The preliminary results were most remarkable (Silkin et al., 1962) (Figures 6 and 7). Press conference at Moscow State University in 1963 devoted to IGY results. 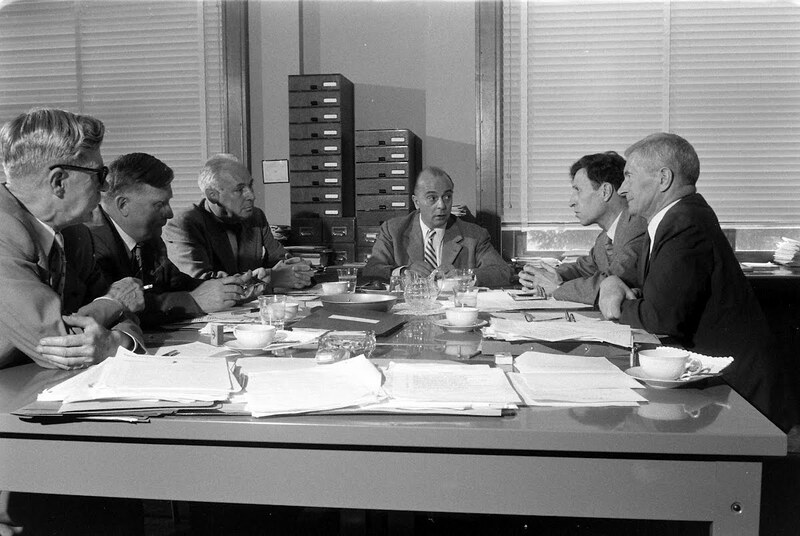 The man standing is the chairman of the Geophysical Committee under the Presidium of the Academy of Sciences of the USSR, V.V. Belousov. A.D. Povzner, N.V. Shebalin, N.V. Pushkov and V.A. Magnitsky (from left to right) are sitting at the table. It is important to emphasize that at that time the remarkable success of the IGY was due to the cooperation of scientists from many countries. Therefore, the IGY has gone down in history of science and of nations in general as one of the most important and noble enterprises undertaken by mankind. In an unprecedented effort, information about the life of our planet was accumulated by thousands of experts from various nations during the thirty-month IGY. The IGY data are unique since the phenomena and processes occurring on the Earth and in the near-earth space are unique. They are invaluable. Even if a small part were lost, the continuity of the observations would be broken. One of the major IGY aims was to ensure the safekeeping of the results. Another was to provide easy access to the results to anyone wanting to study and compare the observations. An essential feature of the International Geophysical Year was the agreement between the National Committees of two leading countries – the USSR and the USA - that World Data Centers be established. They would collect the data and create equivalent archives of the global observations covering all the geophysical disciplines of the IGY program. The centers willingly exchanged free-of-charge copies of the material that were received from investigators. The information was available to all countries and to all scientists at any WDC. During the three years following the start of the IGY, the WDC’s accumulated about 3 million units of storage. This resulted in the creation of the largest scientific archive that had ever been created, one containing information about all areas of the physical life of the planet. It was indeed a “gold mine” of information about the geosciences. This information was made available to both scientists and the public by publishing reports on the data collected and the results of the analyses in journals, reports, catalogues, and books in many countries. The official organization sponsored the publication of a new scientific journal — the Annals of the International Geophysical Year, or the IGY Annals for short. The journal was printed for several years in England; the volumes covered not only the programs conducted and the manuals for the devices and techniques, but also the first results of the investigations. In Russia, the results were published in “The IGY Results”, a publication sponsored by the Soviet Committee (Soviet Committee …, 1982; Kharin & Sergeyeva, 2007). After the IGY, it became clear that the basic purpose of world science is the common study of our planet by all nations that scientific cooperation is needed during experiment preparation, initiation, and analysis. The scientific scope grew far beyond what was first proposed. Several solid earth projects and programs were undertaken following the IGY program, and Russian scientists participated in those as well. In 1960, the General Assembly of the International Geodetic and Geophysical Union endorsed the Upper Mantle Project proposed by V.V. Belousov, and 53 countries joined the undertaking. The major aim of the project was to improve geophysical knowledge and understanding of the Earth’s interior, of the processes in the asthenosphere (a plastic layer in the upper mantle containing the magma sources feeding volcanoes), and of the formation and development of the Earth’s crust. The main result was a new theory of geosciences called “plate tectonics” (Belousov, 1986). The next project, the International Geodynamic Project, focused on the Earth’s interior. Particular attention was placed on the physical properties of the Earth’s interior, the correlations between the endogenous processes responsible for mineral formation, the slow secular land uplift and the long periodic variations of the sea level, the disposition of oceans and continents in the past, and the development of rift structures in the continents and oceans. The scientific interests of the Soviet geophysicists were extended to include research in other countries. For example, with the assistance of scientific and government organizations in the target countries, Soviet geophysicists mounted two extremely fruitful expeditions: the Soviet East-African geological-geophysical expedition (1967–1969) and the Soviet–Icelandic geological-geophysical expedition (1971–1973) led by V.V. Belousov (head of the Soviet Geophysical Committee, 1961–1990) (Rodnikov, 1974). The experience gained during the International Polar Years and particularly during the International Geophysical Year has shown that international cooperation is necessary for a detailed scientific study of the Earth to define a human reasonable existence. The findings obtained during the International Geophysical Year and from subsequent international endeavours have enabled us to learn more about the deep structure and geophysical fields of the Earth, to solve environmental problems, and to draw up plans for investigating the most dangerous regions, such as continental margins, which are characterized by high seismicity, volcanic eruptions, and natural cataclysms hazardous to the people living there. In January 1961 on the basis of the Soviet IGY Committee an Interdepartmental Geophysical Committee under the AS USSR Presidium was organized. For nearly 30 years (1961–1990) the Committee was directed by Dr. Vladimir Belousov. From 1960 till 1963 Dr. Belousov was in the office of the IUGG President. On the basis of the Interdepartmental Geophysical Committee in June 1992 the National Geophysical Committee of Russia was formed. The Committee became the national representative of Russia in the IUGG. From 1993 till 2004 the National Geophysical Committee of Russia was directed by a well-known seismologist, corr. member of RAS Gennady Sobolev. On 26 December 2006 аcademician of RAS Dr. Alexei Gvishiani was approved as the President of the National Geophysical Committee of Russia. Belousov, V.V. (1986) Centenary of the international cooperation in the Earth’s study. Chapman, S. (1959) IGY: Year of Discovery, USA: The University of Michigan. Hrgian, A.H. (Ed.) (1956) The International Geophysical Year. Newsletter № 1, Moscow: Soviet Committee of the Academy of Sciences of the USSR. Isaev, S.I. (1983) International Polar Years. In Dubov, E.Y. (Ed. ), The modern geophysics: results, problems, prospects (devoted to the centenary of the First IPY), Moscow: Znanie. Kharin, E.P. & Sergeyeva, N.A. (2007) Gold reserves of the geosciences. Zemlya i Vselennaya (4), 66–71. Povzner, A.D. & Tjupkin, Y.S. (1999) Geophysics is a global science. Zemlya i Vselennaya (5). Rodnikov, A.G. (1974) Geodynamic Project: the recent stage of the international scientific co-operation. In The Science Today, Moscow: Znanie. Silkin, B.I., Troitskaja, V.A. & Shebalin, N.V. (1962) Our unknown planet. Moscow: AN USSR. Soviet Committee of the Academy of Sciences of the USSR (1982). Moscow: VINITI. Troitskaya, V.A. (1957) International Geophysical Year. Moscow: Sovetskaya Rossiya.